Kalia is a spicy fish curry loved for its superb taste. Large and mature Carp or Hilsa fish should be selected for this preparation as the fat and oil from such fishes add to the taste. We have used grass carp, a fish common in eastern regions of India and Bengal as also in many other parts of the world. Next, the spices will be sauted with onion and yogurt to create the gravy. And finally, the fish will be added to the gravy and cooked to completion. 1. Sprinkle turmeric and salt on the fish pieces and marinate them uniformly all over. 2. Leave aside the marinade for about 5-10 minutes. 3. In a moderately hot pan, add 3 tablespoons of oil. 4. When the oil is hot to touch, add the fish and fry on all sides for about 3-4 minutes. 5. You may want to cover the pan if it splatters. 6. All sides should look well fried. 7. Remove the fish from the frying pan and keep aside. 8. Heat about 2-3 table spoons of fresh oil or use the left over oil from frying the fish. 9. 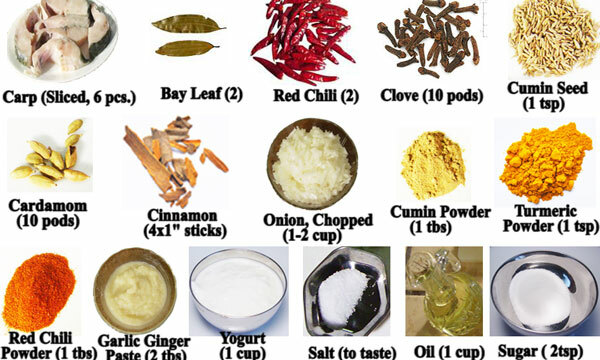 Add the Indian bay leaves. 10. the dry red chili. 15. and stir them well. 16. Then add the chopped onion. 17. Continue stirring for several minutes till the onions become golden brown in color. 18. Add the garlic ginger paste. 19. Then add red chili powder. 21. And the turmeric powder. 22. Stir them for a minute or so. 23. And then add a table spoon of yogurt. 24. Stir continuously to mix them uniformly. 25. The yogurt should be added one table spoon at a time over a several additions. 26. and they need to be stirred constantly otherwise the spice mixture may get burned. 28. Stir them together till the mixture becomes semi dried and well cooked. 29. Then add two and a half cups of water. 30. Stir well to make a uniform gravy. 31. Add two spoons of sugar. 33. and as the gravy comes to a boil. 34. Add the fried fish into the gravy. 35. be careful so the fish pieces do not break apart. 36. Cover the pan and let it cook for 2 minutes or so. 37. As the gravy thickens remove it from the heat. 38. This completes the fish kalia preparation. 39. It takes about 40 to 45 minutes to cook and serves 2 to 3 people. 40. 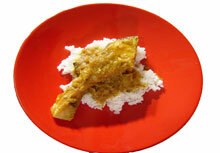 Serve the fish kalia hot with steamed white rice.